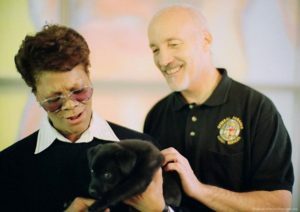 Dionne Warwick joined me in announcing LA Animal Services’ innovative new program proposed by realtor Adele Langdon. Inspired by Dionne Warwick’s smash hit, “A House is not a Home”, it occurred to Adele that there was a way to make a house a home and that was by adopting a pet. Adele designed The House is not a Home without a Pet program to help our community’s homeless animals. The foreclosure crisis in Los Angeles has resulted in a 28% increase in the number of pets surrendered to LA Animal Service since the beginning of 2008. This has led to the first increase in pet euthanasia in over six years. Keller Williams has decided to do something about that and to challenge all Los Angeles Realtors to help. The program encourages real estate agents to purchase a $100 Gift Certificate from LA Animal Services to present to their clients at the close of escrow of their new home. The Certificate becomes effective 30 days after the close of escrow and is effective for one year. The Certificate is good towards the adoption of a dog, cat or two bunnies. Adele convinced Keller Williams Realty of Beverly Hills to spearhead the program. The Beverly Hills Office encourages other Keller Williams Offices and Real Estate companies to get on board. Keller Williams is announcing the program with a full page ad in this week’s MLS Caravan magazine received by all LA real estate agents.